ab33483 recognizes the murine homologue of human CD11c (150/90kD) integrin family. 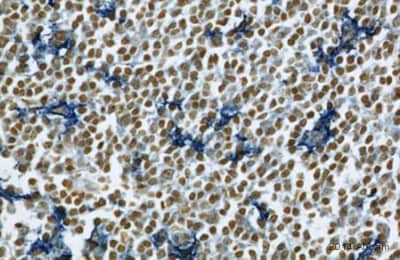 This product is recommended for IHC-Fr only although some customers have used it successfully in IHC-P.
Tissue, cells or virus corresponding to Mouse CD11c. 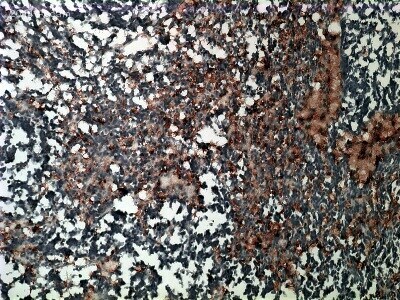 IHC: mouse liver tissue, mouse spleen tissue Flow Cyt: Mouse splenocytes. Clone N418 has been reported to enhance antigen specific responses when used to target dendritic cells in vivo. Our Abpromise guarantee covers the use of ab33483 in the following tested applications. 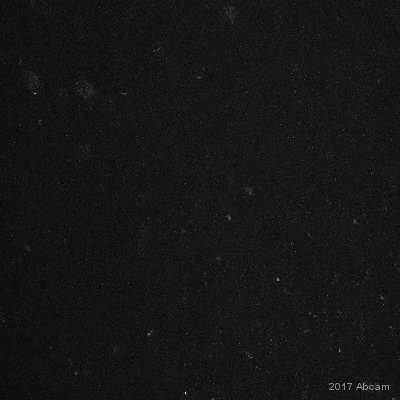 Abcam recommends using acetone fixation. 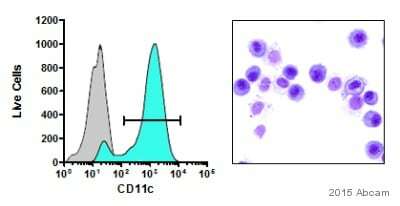 Mouse splenic cells were incubated with anti-CD11c antibody ab33483 at 1/100 dilution for 30 min at 4°C. The secondary antibody used was goat anti-Armenian Hamster (Alexa Fluor® 488) preadsorbed at 1/100 dilution for 30 min at 4°C. The cells were simultaneously stained with CD3 PE-conjugated (ab22268) at 1/200 dilution. Acquisition of >30,000 total events were collected. Gating strategy – events were collected with the forward and side light-scatter characteristics of viable lymphocytes. Flow cytometry analysis of murine alveolar cells extracted using bronchoaveolar lavage in balb/c mice using 3mM PBS-EDTA, labelling CD11c with ab33483 at 1/2000, incubated for 20 mins at 20°C. Secondary used was ab175680 at 1/2000. Gating strategy was against CD45+, C11b+, GR1-cells. Immunocytochemistry/ Immunofluorescence - Anti-CD11c antibody [N418] (ab33483)Image courtesy of Wang J et al, PLoS Pathog. 2010 Aug 19;6(8). 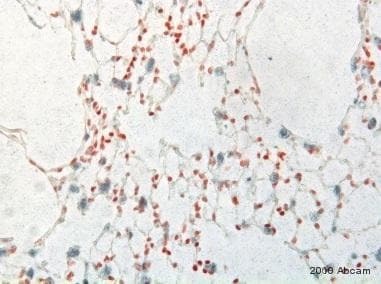 pii: e1001058, Fig 5.
ab33483 staining CD11c in murine bronchoalveolar lavage (BAL) cells by Immunocytochemistry/ Immunofluorescence. 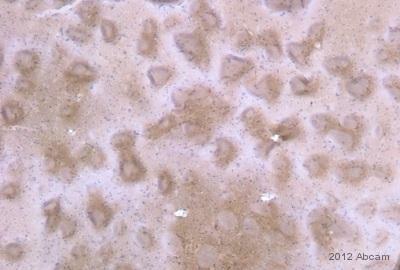 BAL cells were collected from PBS treated mice at day 13, 17 or 18 (17/18) and 21 post-reconstitution. Cells were stained with ab33483 specific for CD11c (green) and Pc (red). 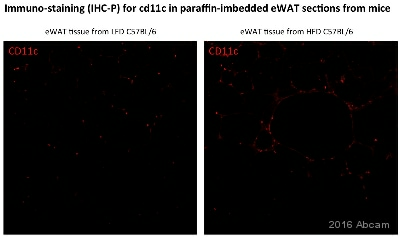 Representative images of brightfield (BF), CD11c, Pc, and merged CD11c/Pc are shown for PBS-treated mice following immune reconstitution Day 21. Publishing research using ab33483? Please let us know so that we can cite the reference in this datasheet.